On Saturday afternoon, Tualatin's James Bachman picked through the last of his dozen seasoned crawfish Saturday. For Bachman, it was his first time eating crawfish. 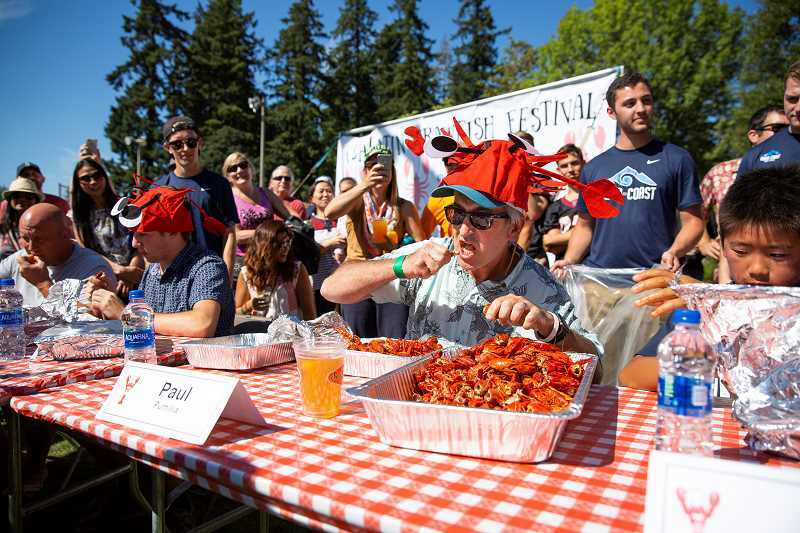 "It's a lot of work," he noted as he munched away at the small red creatures during Tualatin's Crawfish Festival. "It's really good. I love seafood. I love lobster." The annual event kicked off Friday night with a Twilight 5K and Relay Run/Walk in Tualatin Community Park. "Last night was incredible," said Charles Farrenkopf, manager of operations for Hood to Coast, which puts together the annual event. He said between the runner/walkers, and those who came to see both Ramble On (the Led Zeppelin tribute band) and the main event, Stone in Love (a Journey tribute band), 2,500 people jammed into the park located next to the Tualatin River. But by the middle of the afternoon, all eyes were turned to the crawfish eating contest, featuring 12 participants, hovering over a total of 60 pounds of crawfish. Within seven minutes, Dr. Paul Pumilia, had polished off three pounds of the small crawfish, and was declared the winner. It was the second time for the internal medicine doctor from Bonney Lake, Wash. He ate three pounds of crawfish in seven minutes, making him the hands-down winner. "The secret is popping the head and pulling the tail correctly," he said of the ideal eating method, noting that for him it's two bites, then swallow. This was the second appearance for Pumilia who two years ago also took home the grand prize of a $25 gift certificate. "In 2016, I ate 139 crawfish in 7 minutes, 33 seconds," boasted the Louisiana native. But since they changed the method of counting last year, he only knows the weight of the consumed crustaceans. Other activities during Saturday included an appearance by the Reptile Man (who brought along 12 of his reptilian friends), along with a variety of games for the kids at the KidsCrawl station including a potato sack race and a popular super-soaker fight. 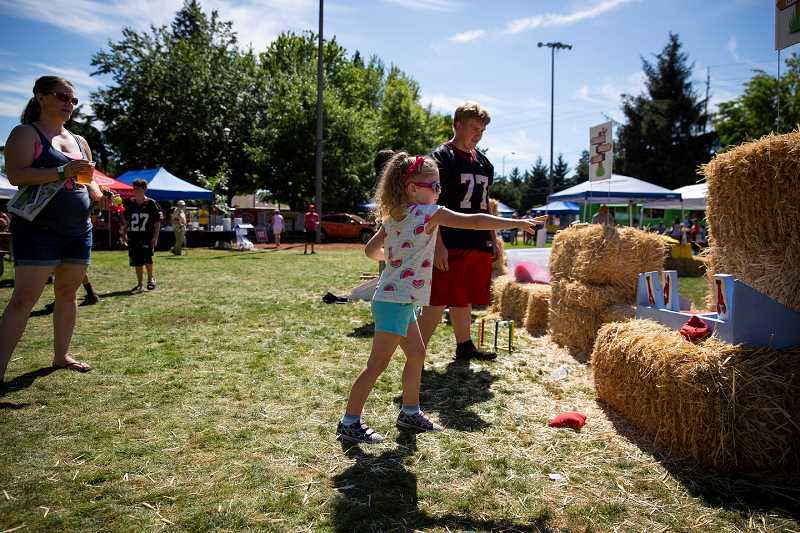 Dan Floyd, chief operating officer for Hood to Coast, said particularly popular this year was the corn hole tournament (which is essentially a bean-bag toss) where 32 two-member teams participated. "They were awesome," said Floyd. He praised Farrenkopf, the company's operations manager, for transforming the event into a family friendly affair. Floyd said the Twilight 5K and Relay Run/Walk was wildly successful, drawing 400 people to the race and 30 four-person teams to the relay. Hood to Coast has been putting on the run and relay event for five years and overseeing all activities for the last two. "This by far is the best year," he said, noting that the event has improved over the years. "People are having a good time. It's been revived." He noted that vendors looked like they were doing good as well. "We want the chamber to be happy," he said. "If they're successful, we're successful." Meanwhile, at the KidsCrawl events, Ephrem of Tualatin watched a bunch of kids get soaking wet by shooting each other with super soakers. But the 9 year old was more keen on the fact he would soon be getting an elephant ear, the large doughy cinnamon treats that one vendor was selling. He said his anticipation was based simply one the fact that elephant ears are "just good." At another part of the park, Brett Coe of Happy Valley was trying his luck at the Buddy Bar Challenge or as the sign stated: "100 seconds to win $100." The trick was to hang from a pull-up bar for 1 minute and 40 seconds to win the prize. Coe hanged from a bar, arms over his head without dropping for only 40 seconds. He pointed out that when he tried to reposition his hands, the bar twirled making it so you couldn't hold on any longer. Shane Baker, who runs Buddy Bar Challenge, said the record as of late afternoon was 85 seconds with 12 adults having tried the challenge so far on Saturday. Baker said roughly one in 50 individuals win the prize. "We love the festival," he said. "It's great." Back at the crawfish eating contest, Dr. Pumlia said he felt good after the contest and planned on going out to dinner with his family. "This is a good appetizer," he said. "Last time we were here, after the competition, we ate halibut."